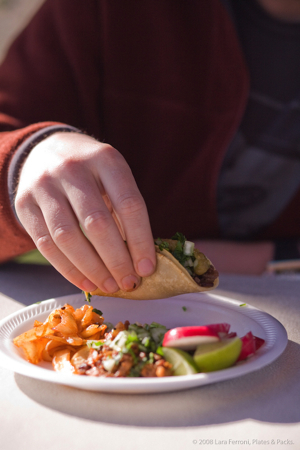 There has been a scheme in the works for some time now to have a day devoted to tacos. We’ve (Cam and I) been sampling various trucks and busses one by one for the past year, but never on a particularly organized basis and it became too hard to decide which one was really the best. Memories quickly fade, and we just end up with vague recollections of what we did or didn’t like. This would not do. We needed hard data to compare and contrast all the tacoy goodness. 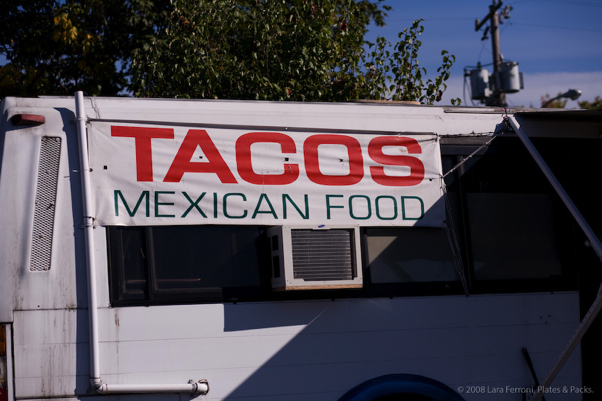 So, we decided that we’d pick a beautiful sunny day, and just drive around, trying tacos at the various Seattle taco trucks, to try to decide on an ultimate winner of Seattle’s Best Taco. Saturday, October 11th turned out to be that day. 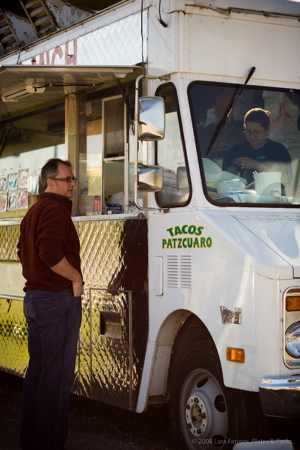 After a morning of planning to find all of the taco trucks online that I could, and organizing a set of directions to most efficiently get us from spot to spot, we picked our targets and headed out. 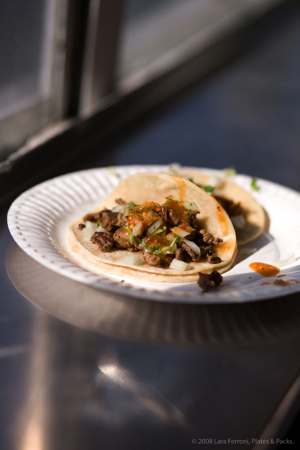 Of the 27 trucks I plotted, we’d try to go to 8 or 9 of them, ordering one carne asada and one al pastor taco at each, and splitting each of them. We were allowed sides but given the number of stops we had ahead of us, we were just going to stick to the two taco rule, at least until the end of the day. 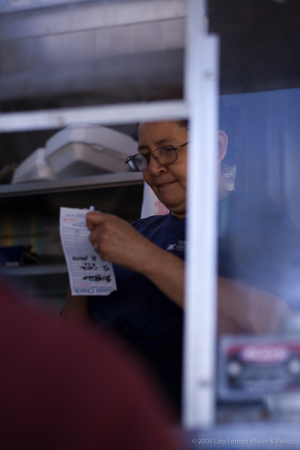 The first stop was our closest truck, Rancho Bravo, in Wallingford. This truck is set up in a Winchell’s doughnut shop parking lot so you can always grab a doughnut if the craving strikes you after your tacos. At $2 each, these were the most expensive tacos we tried (which isn’t surprising given the neighborhood), but they were also some of the biggest. The corn tortillas are full size (but seem store bought), and well filled. 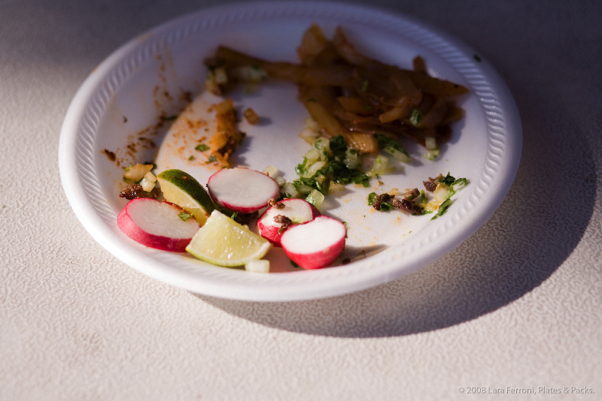 The tacos have sliced, fresh radishes in addition to cilantro, onion and lime, and the salsa they have on the table are quite good. I like the salsa verte which has a bit of a kick. 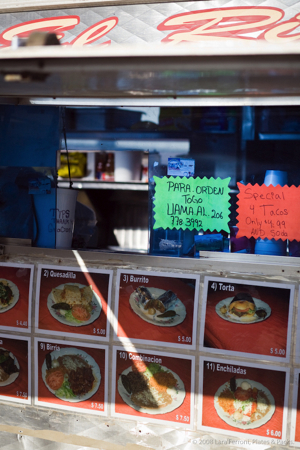 Next, it was over to El Asadero, which seems to be a Seattle favorite. 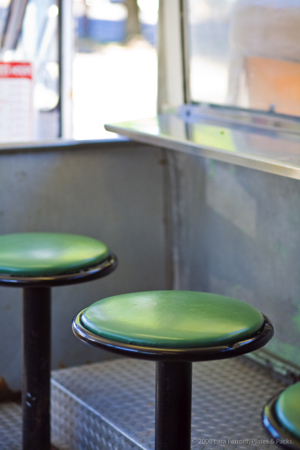 First off, there is something about having tacos sitting on the little stools inside this old school taco bus that really completes the taco eating experience. They also have great pickled carrots and peppers. The tacos ($1.20 plus tax each) are good. 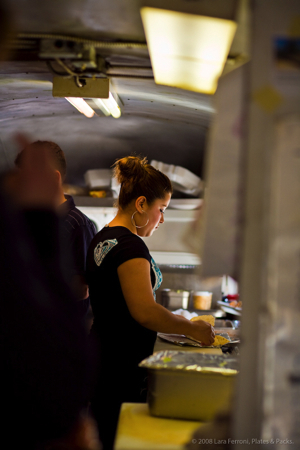 They are the usual small, double tortilla shells which seem to be housemade. The meat is good and juicy, with lots of flavor. Cam thought they were a bit heavy on the onion. 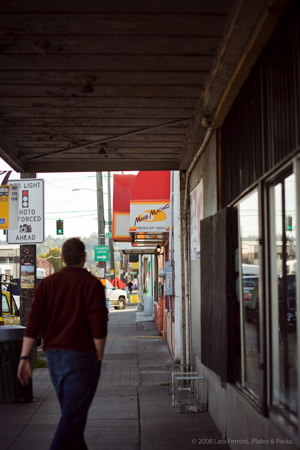 We kept heading down Rainier, hoping to find Taqueria Dos Hermanos, but it wasn’t around, so may have either moved or gone out of business. 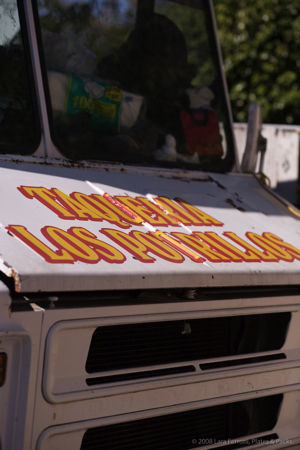 A few blocks further south, we found Los Potrillos, a small truck parked in a gas station parking lot. 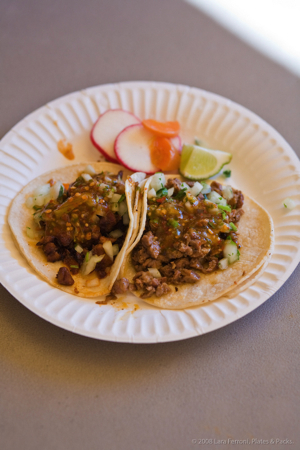 These tacos ($1.10 each) were drippy juicy with lots of diced meat and salsa. I wished for a bit more cilantro, but the onion balance was nice. Next up was perhaps my favorite stop of the day, Costa Alegre. 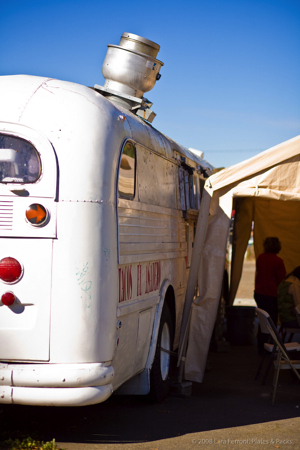 This old metro bus (complete with the old Priority Seating window stickers) is decked out with bright red, rodeo-inspired curtains, tables and chairs. It’s red overload, but quite comfortable and feels very homey. The folks that run it are lovely. 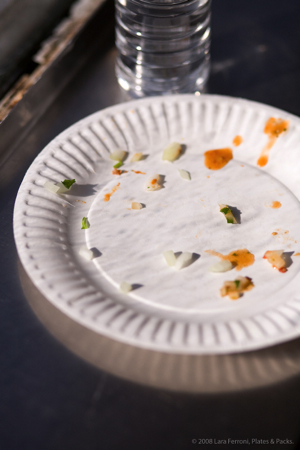 You even get to eat on real plates! Our tacos ($1.25 each) were super hot and fresh, with a good balance of cilantro (ie: lots), onion and meat with good red and green salsa to add yourself. They also had some sort of non-alcoholic sangria, but we passed on that. 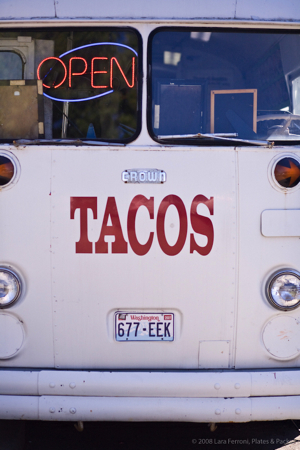 We’re not really sure what the next taco truck was called. 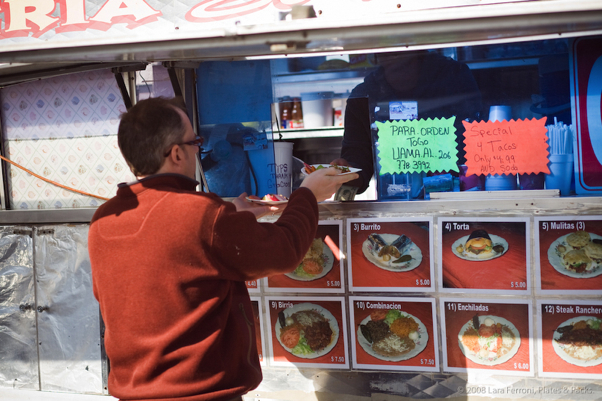 The menus all said Tacos Maria, but the truck itself said Tacos Patzcuaro. This truck, parked on someone’s front lawn on MLK Blvd, is going to get swamped when the light rail system is in right across the street. 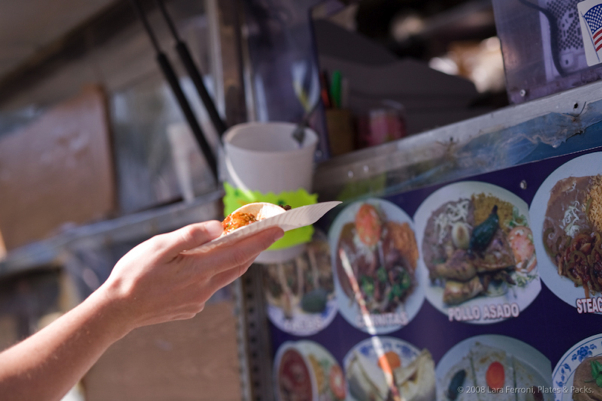 For now, it kept a stead pace of taco eaters happy with its small taco shells heavily loaded with meat and a pile of caramelized onions on the side ($1.25 each). The salsa verde here is a bit on the sweet side and the red is quite hot. It was about this time that I was starting to get pretty worried about how I was going to finish this crazy taco eating extravaganza. We were on truck #5, with 3 more planned to go. The radishes were no longer going to be eaten. We had made it through all the Rainier trucks we had planned, so then it was off to South Park for a couple of well known stops. 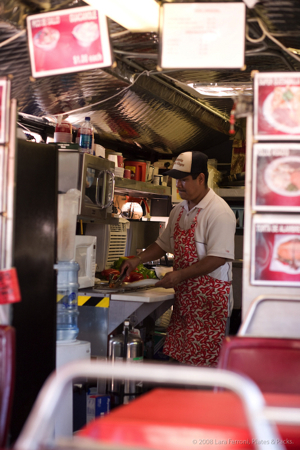 El Rincon (which has several different trucks around) on 14th was first. 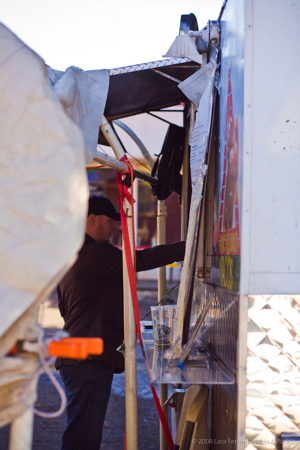 This truck had a line the whole time we were there waiting for it’s super juicy $1.10 tacos. The pork bordered on greasy, but in a lick your fingers clean kind of way. These had just the right balance of cilantro and onion to meat. 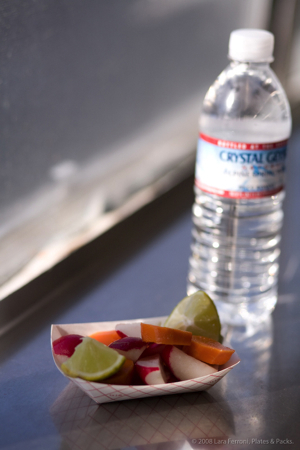 They came with pickled carrots in addition to radishes and lime, but I was not a fan of them. 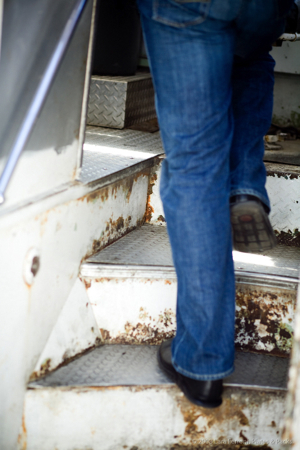 And, oh god, there are still 2 more stops to go…. 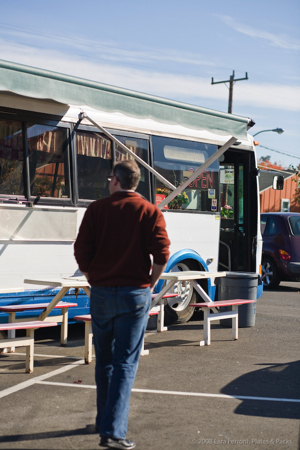 Further up the street in South Park is Muy Macho, which used to be a taco truck, but now has a permanent restaurant. 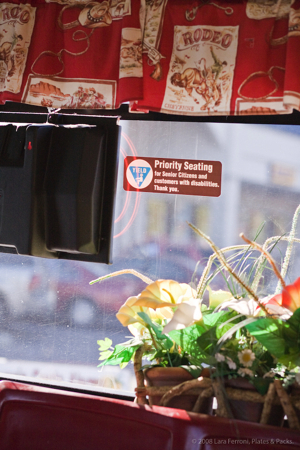 Despite lots of seating, we decided to get ours to go to keep with the taco truck theme, so we ate them in the car. Muy Macho probably has the most interesting and best salsa of any of our stops, but on our visit, both the pork and the beef were too dry and kind of unpleasant. They were the cheapest of the day though, coming in at a very odd $1.095 each (how they charge a half-cent we couldn’t quite figure out). We had one more stop to go. A mystery truck that was supposed to be located in the parking lot of the 76 gas station in Georgetown. 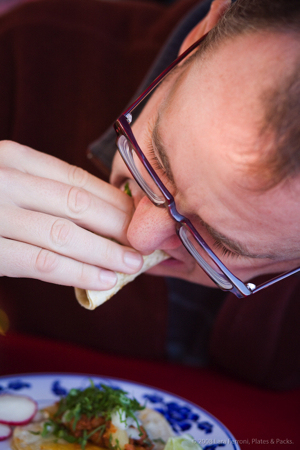 At that point, I thought I was going to explode and I was seriously not looking forward to trying yet another taco. I had definitely hit my limit. Seven tacos is too many tacos. As we pulled into the 76, and looked around, I think I gave a little scream of delight. The mystery truck was nowhere to be seen. We were done. Whew. Instead, we stopped into All City Coffee for a late afternoon mocha as a digestive and shared a cupcake Cam had made earlier in the day at the Edible Seattle event at Metropolitan Market. 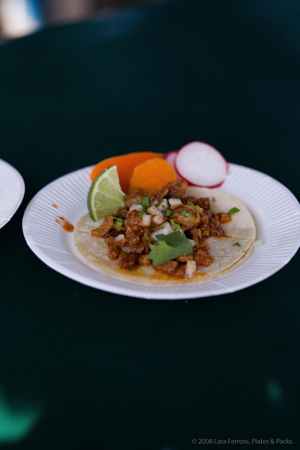 As we reviewed our carefully taken notes from the day, and I whined about too many tacos, we mulled over who would win the Seattle’s best taco award. The end result? 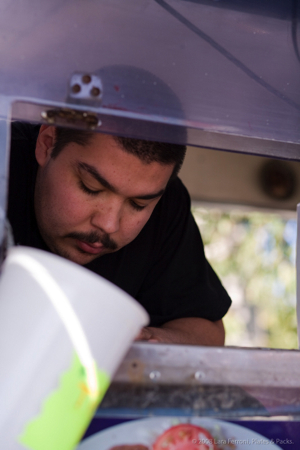 It’s whatever taco truck happens to be closest to you. I won’t go so far to say that they are all the same. But, they are all good enough when the taco craving strikes. 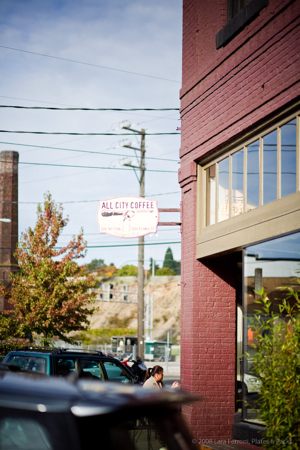 This entry was posted in About Me, Food, Lunch, Other, Seattle Restaurants, Travel. Bookmark the permalink. Hmm, I may have to try this here in Tampa. 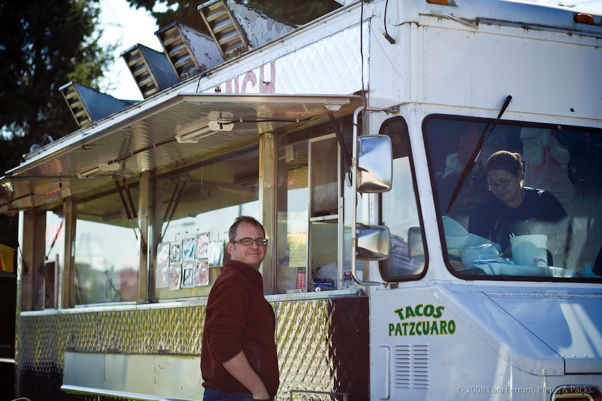 The taco trucks are a new addition to city life here, and I told my husband about them from other cities but he’s skeptical. 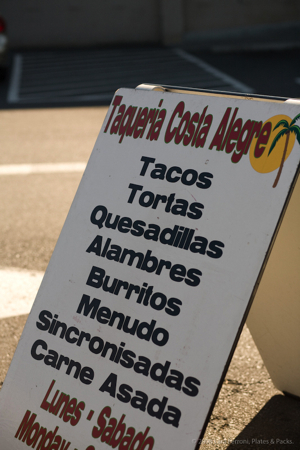 There’s certainly not 27 taco stands here, so we might be in good shape. Plus, he can put away the tacos when the need arises, so I could always have a bite or two and then slough the rest off on him. 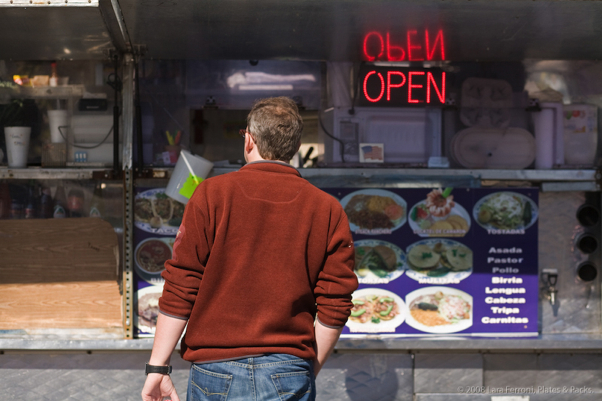 I have to say, I remember the south end taco crawl being much more delicious (and affordable) than the Seattle leg. 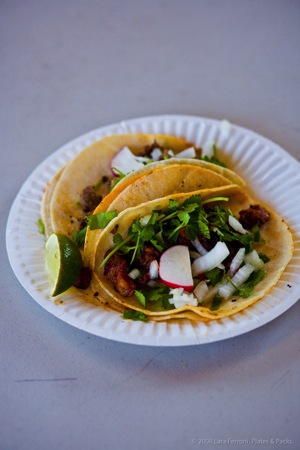 god… how i miss tacos! 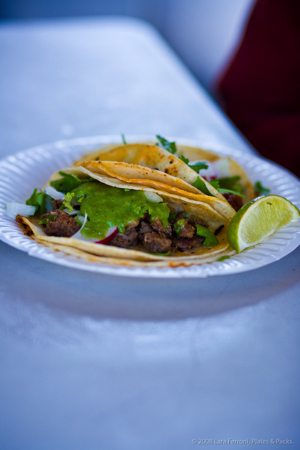 proper tacos, proper streetfood, i mean! you can’t even replicate that at home if you tried! when i lived in mexico i’d nip out of school ever morning to get some sopes from across the street – an old, wrinkly lady, barely a tooth in her mouth, would sell them from a tiny opening in a wall, she barely had a square metre to operate on – but they were the most delicious sopes i have ever tasted. 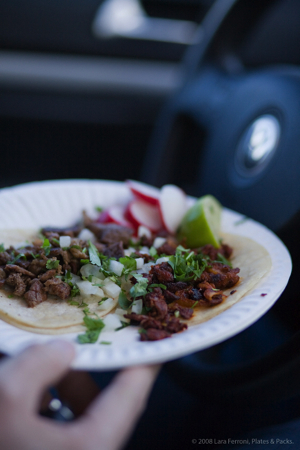 i wish we had some taco vans here, we don’t even get much mexican food (authentic, i mean) in restaurants here in london… and your pictures make me crave it so badly! Seven taco’s!!! holy cow, I would explode. That is certainly too many taco’s 😀 but great job doing the research!! looked like fun. Great photos as usual – they have a lovely cold, autumn feel to em. HOLY COW!!!!!!!!!! i DID explode haha. This is my ghost commenting. Funny that I never tried tacos before. Love the photos and they shore open my appetite to taste some one of this days. 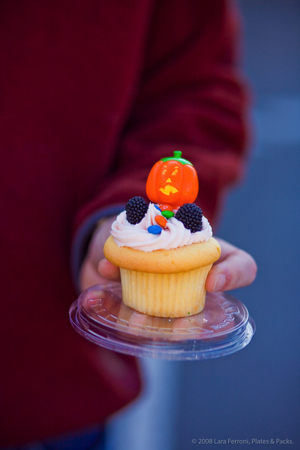 (how many have you tasted?). 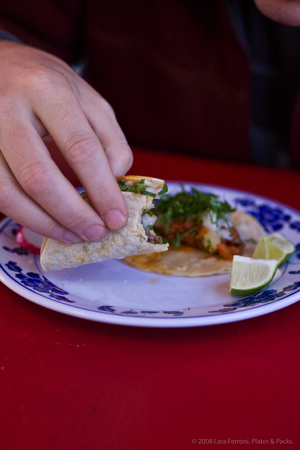 One can never have too many tacos…obviously! 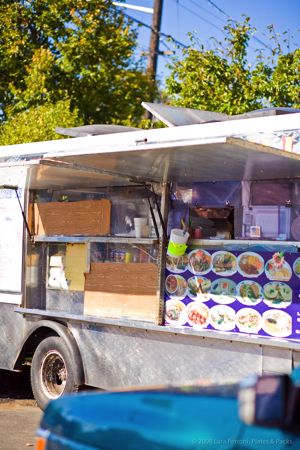 Man I love a good taco truck! 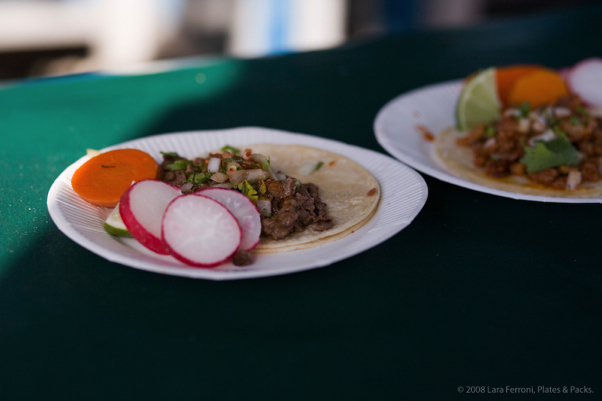 I love the taco crawl idea and in San Francisco they’re pretty plentiful so it should be fun. Fabulous pics and post. 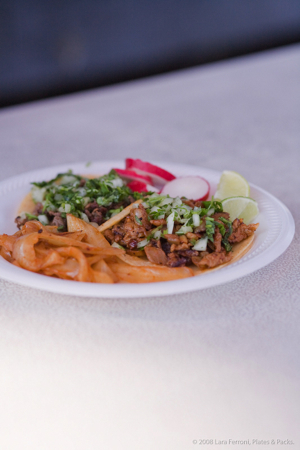 no taco trucks here in old grey London, but your photos are mouthwatering. They all sure do look delicious! Love your new site design (hadn’t checked for a long while) too. 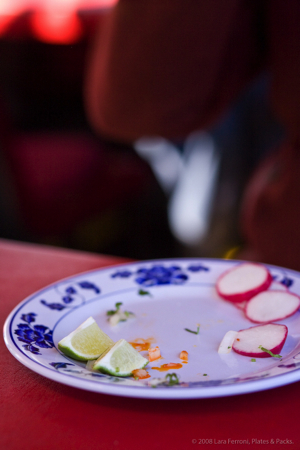 OK – reading this tonight just made me crave Mexican again! what an awesome post. you really hit all the good ones! 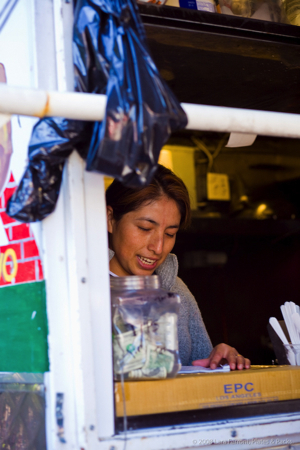 we live pretty near Maria’s — dig the tacos, but the pupusas are the really special thing that they make. and you gotta love sitting in their yard while you eat. once, we brought a ton of friends and they just kept bringing out extra lawn chairs from their yard to accomodate us. 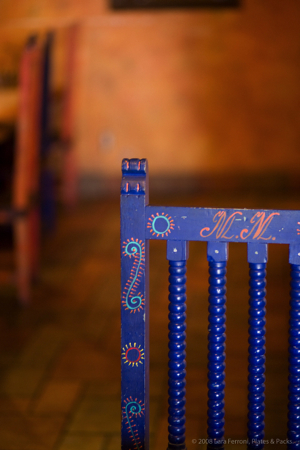 (the picture of the chair in muy macho is really nice). Nice pics Lara. 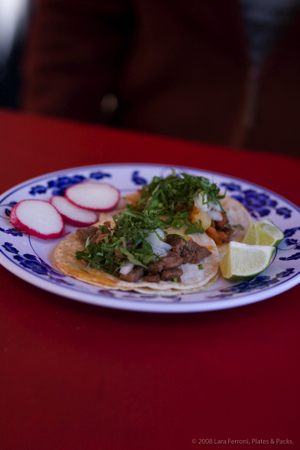 I look forward to seeing your photos for the upcoming taco book. We hung out a lot at a friend’s house in Burien during winter 93. Coming from SF, we were always looking for tacos. 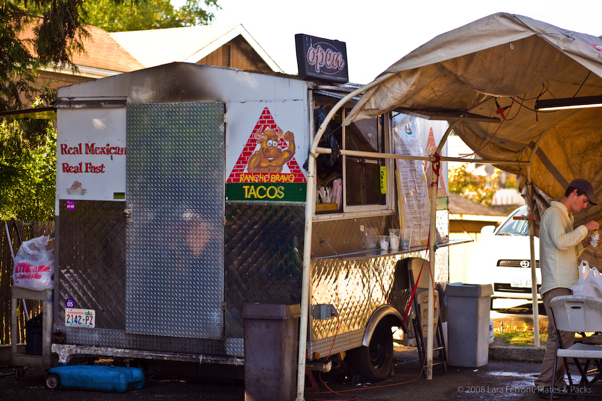 White Center was the only place with any good tacos. 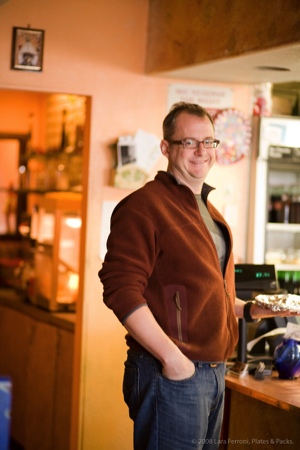 The Seattle taco scene has come a long way since then. Hats off to all of our Mexican friends. My brother and I do that every time I visit him in LA. Its a lot of fun. KInd of like a scavenger hunt!